Done right, training will benefit not only your dog, but also you. 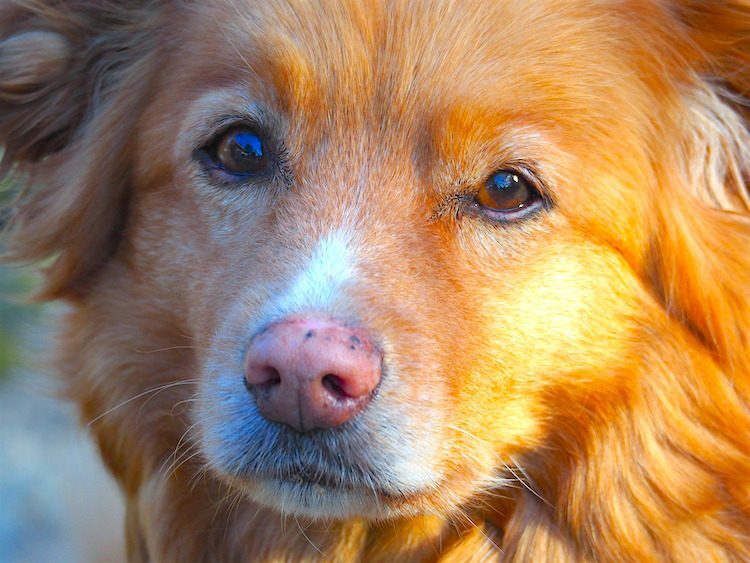 Here’s our expert guide to training an older dog. You’ve probably heard the saying “You can’t teach an old dog new tricks” — but what if that isn’t the whole truth? Although some things are best taught to dogs while they’re still young, your dog can still learn in any stage of their life. The process may be harder, and it may take longer with certain types of training, but all hope is not lost with your older dog — actually, far from it. 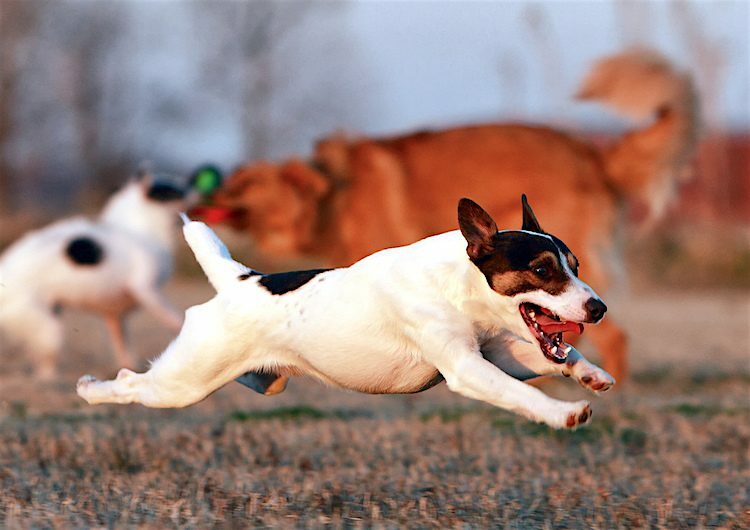 Socialization: Training your dog to adapt to social and environmental situations. Obedience: From important basic commands to fun tricks. Potty training: This could be categorized under obedience or behavior modification, but it’s such a common issue that it deserves its own spot on this list. You may be wondering: Is a 1-year-old dog too old to train? Rest assured that whether your adult dog is 1 or 10 years old, there are huge benefits to training now. Create and grow the bond between you and your pet. Help your dog become more enjoyable to live with. Earn your dog more freedom and let them participate in your life more. Keep your dog healthier — both physically and mentally. Allow you to keep a dog you would otherwise have to give up. Training at its most basic level lets you communicate with your dog. What you communicate to them is up to you, but training paves the way for it. Ready to learn? Let’s get started with Part 1 of our expert guide to training an older dog. Why Socialize an Older Dog? When my Border Collie, Mack, came to live with me at 1 year old, I was so excited to have a dog who could hike trails and climb mountains with me all over the country. But it didn’t take long to realize he had an odd fear of slippery floors. He was also afraid of men. Flies were enemies, and automatic water dispensers were terrifying. Although most of these things didn’t have a dramatic effect on his well-being, I still had to work through them with Mack. Mack hadn’t been exposed to things like slippery surfaces as a puppy, but with training, he was able to overcome those fears over time (except for the flies). The fact that he attended daycare as a puppy made it a lot easier for him to overcome his fear of men. Between the time your puppy’s eyes and ears open — around 2 weeks of age — and about 16 weeks of age, your puppy will go through a major developmental period. What happens during that time will have a huge impact on their ability to later adapt to certain situations and feel confident around people and other animals. Puppies at this age are like blank pages, waiting to be filled with wonderful experiences. They depend on what they learn during that period, deciding what is normal and safe in their life — and what should be avoided. If you have a puppy or bring one home in the future, then socialization should be your biggest training priority while they’re young. But What If I Missed the Socialization Window? Want the hard truth? You’ll have more work ahead of you if you missed the crucial puppy socialization window. And, worse, your dog may never completely catch up. Fear not, though — you can still do a lot to help your adult dog learn about the world around them, help them adapt to it and be less fearful or reactive. Take the dog with you to as many places as you can, but start with the calmest, easiest locations first, and work up to the more difficult places over time. Make these outings fun with treats, training sessions and games. 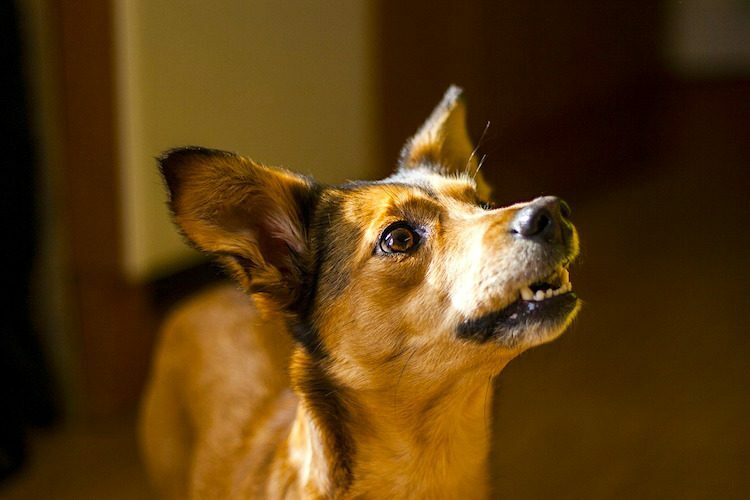 Feed lots of their favorite treats or pieces of dog food every time your dog experiences something new or scary. Make the encounter fun. Do a little dance! Praise them and act excited about the new thing. Give them feedback while they’re still deciding what to think about something. If you watch your dog, you will notice them watching things around them and deciding what to think about each thing. When you notice them doing this, praise them, act happy and give them a treat. By doing this, you’re telling your dog that they don’t have to be afraid of that new thing. 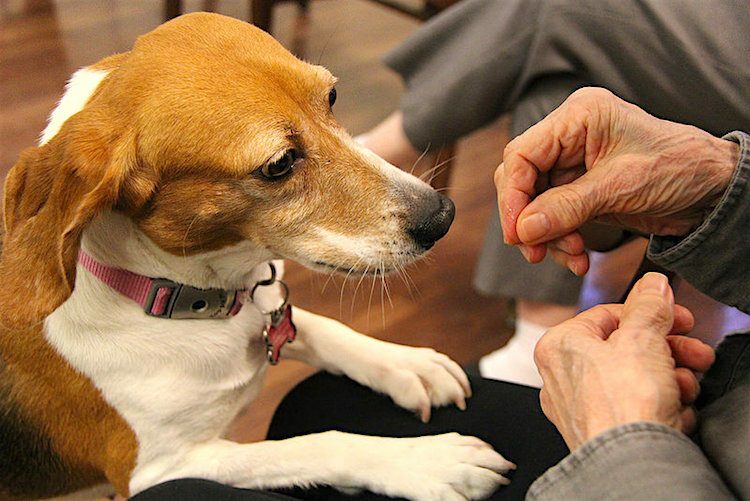 Recruit lots of calm volunteers to feed treats to your dog. If your dog is afraid of people, start by having someone your dog doesn’t know toss some treats from a distance every time the dog calms down for a second. When your canine friend becomes more comfortable with people, have one person at a time offer treats straight from their hand. Eventually, you can get the dog used to touch, too, by having the volunteer give a treat every time the person gently touches your dog. Do this with as many people as you can, one person at a time. If your dog may bite, please get professional help. Find a trainer who has a lot of experience dealing with aggression, reactivity and fear; it helps to get recommendations from other dog lovers on someone who’s well respected and who has the environment and resources to socialize your dog safely. If your pup is afraid of people, you may need a training group with multiple trainers so your dog can be exposed to multiple people safely. Take your pet to dog-friendly locations with a lot of space. Let your dog see other dogs from a distance and reward yours with a treat or favorite toy whenever they glance at another dog, focus on you around another dog, behave calmly or obey your command. Practice obedience while the other dog is nearby. Focus the most on a structured “heel” command, and keep your dog moving so they have to focus on you rather than on other dogs. Reward heavily for obedience during the training. Practice walking with other calm dogs. Start walking both dogs past each other from a distance while you reward your pet for focusing on you and staying in the heel position. As the dogs become comfortable with each other, gradually decrease the distance between them. Do this until you can walk them within a few feet of one another going in the same direction. If your dog is not aggressive toward other dogs, then practice brief greetings with other calm, well-behaved dogs. Let the dogs meet by walking them alongside one another from a distance until both dogs are relaxed. Gradually decrease the distance between them over time, then let the dogs briefly sniff one another while they are calm. Keep the greetings to 3 seconds to prevent potential fights or intimidation. Avoid meeting dogs who are not friendly and well-behaved. When Mack came to live with me, he knew only 3 commands. During those first 2 years he lived with me, however, he learned over 90 different words and commands. Out of all the training mentioned in this article, obedience is the easiest to teach an older dog. What If My Dog Is Elderly? Most of the time, you can teach an old dog new tricks. 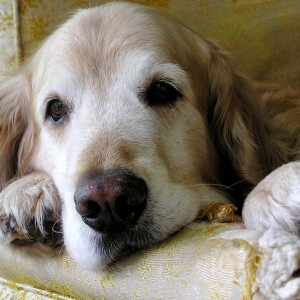 If your dog is very old, though, you may be limited by their health. For example, if your dog is arthritic, then they probably can’t learn to do a backflip or a limping trick. If they’ve started to decline mentally, then their ability to learn new things could be damaged, and they may simply be incapable. The other side of this is that training could improve their mental health and slow down their degeneration through exercising their brain. That mostly depends, though, on how progressed the disease is and how fast acting it is. When training an older dog in obedience, be patient and suss out any physical limitations that they have. Adjust the training to help them succeed, recognizing their efforts to please and attempts to learn. 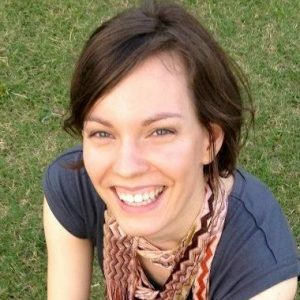 Is It Ever Too Late to Modify Behavior? Behaviors are far easier to teach your dog when they’re still young because they haven’t learned any bad, opposing behaviors yet. Puppies are blank slates. Your adult dog can be taught, though. The process of modifying an adult dog’s behavior will probably look different from the process with a puppy. 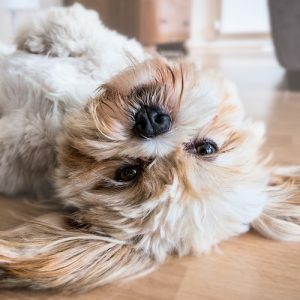 Modifying your adult dog’s behavior will involve both getting rid of the unwanted behavior and replacing that bad behavior with the good behavior that you want instead. 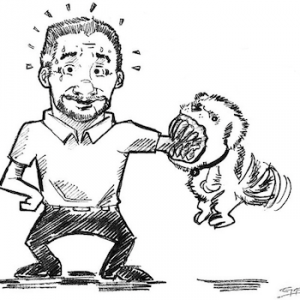 You must interrupt the unwanted behavior and make that unwanted behavior unpleasant for your dog. Since the unwanted behavior is no longer fun for your pet or has been interrupted, you then have an opportunity to teach something in place of it. For behavior modification to be successful over the long term, your dog needs to learn something “good” to do instead. Reward this wonderful new behavior so your dog has a reason to stick with that behavior instead of reverting to old habits. Is It Ever Too Late to Potty Train a Dog? Your dog has never lived inside and has thus never been potty trained. Your small dog or puppy was taught to use pee pads or paper inside, and now you want to retrain your dog to potty outside. Your small dog was taught to pee outside, but you live in a big city or somewhere with a lot of snow, so you want to teach them to go potty inside or on a balcony. Your old dog can’t hold their bladder long enough to make it outside before peeing or pooping anymore, or they can no longer walk down your stairs to make it to your yard. Your dog needs to learn to use the bathroom inside or on fake grass because of an airplane trip or an event where only indoor bathroom areas are available. Potty training an older dog can be difficult and often takes commitment and consistency on your part — but it’s certainly possible. If your dog has never been potty trained, then teaching them as an adult is not that much harder than training a puppy. Sometimes, it can even be easier because the dog’s physical ability to hold their bladder for longer is stronger than a puppy’s. Is your dog male? If so, you may need to put a belly band on him while he’s in the house. A belly band is a piece of fabric shaped like a sling that covers his private parts. This is a good tool to use if your male dog is trying to mark objects in your home. It can keep your home clean while you work on teaching him not to mark. If you don’t see progress with tethering or by following a strict potty schedule, I suggest crate training. This tends to work well when potty training an older dog because all dogs have a natural desire to keep a confined space clean. Give your dog freedom outside the crate only when you know their bladder is empty. Typically, this means that after 2–3 hours of freedom, you need to put them back into the crate until it’s time to take them outside again. If your dog doesn’t go potty when you take them outside, put them back into the crate and try again in an hour. Repeat this every hour until they go. When you crate your dog, include an interesting toy, such as a hollow chew toy stuffed with dog food and a bit of peanut butter (no xylitol). When you introduce the crate, make it a pleasant place for your pup by leaving the door open and sprinkling treats inside. Replace the treats that your dog eats throughout the day until the dog regularly goes into the crate on their own, looking for treats. When you take your pup to go potty, tell them, “Go potty,” and give 4 small treats, 1 at a time, after the dog goes. Doing this will teach them to go potty quickly when you tell them to. If your dog does not learn how to alert you when they need to go, you can teach them to ring a bell to ask to go outside. Don’t expect your dog to hold their bladder for longer than they physically can. Doing so will force them to have an accident in the crate. After several accidents, they will no longer try to hold their bladder in the crate, making it impossible to train them that way anymore. Most healthy adult dogs can hold their bladder for up to 8 hours during the day. At night, a dog can usually hold it for longer while they sleep. Puppies can hold their bladder for their age in months plus 1 (meaning, for example, around 5 hours for a 4-month-old puppy) — up to 8 hours max by 7–8 months of age. When you’re home, take your dog out twice as often as the maximum amount of time they can hold it for. If your dog can hold it for 8 hours, then take them every 4. Although the dog can hold their bladder for longer in the crate, they are more likely to succeed, they will learn faster and they will be more comfortable if they go potty more often. Clean up any accidents with a spray that contains enzymes. Enzymes will break down the urine and feces at a molecular level, removing the smell completely. Dogs’ noses are sensitive, and any remaining scent will encourage them to go in that same spot again later. Avoid ammonia-containing sprays — they smell like urine to a dog. If so, you’re not alone. These are common questions. Perhaps you’ve recently rescued a small dog or you’ve moved to a new home with a yard. Maybe your dog has begun to confuse pee pads with your area rug. Whatever the reason, the time has come to move your dog’s bathroom habits outside. Training a dog to go potty outside will be harder for an older dog who’s used to going somewhere inside. You can definitely retrain, though, if you’re willing to invest the time and effort. While your dog is being retrained to go potty outside, you’ll need to confine them inside (crate training) whenever their bladder is not empty — or you’ll have to supervise them very closely. I recommend crate training because even though supervision can work, it takes only a second for you to become distracted, making confinement easier than supervision. Do what you can to prevent accidents inside. The more accidents you can prevent inside while teaching your dog to pee outside, the more successful the training will be. Confining your pet in a crate whenever their bladder is not empty is the easiest way to do this. Take up any area rugs if your dog has had accidents on rugs in the past. If you can, block off carpeted areas too. Once the dog is fully trained, bring back the rugs — but supervise your pet when they’re around them. If your dog doesn’t learn on their own how to alert you when they need to go outside, teach them to ring a bell. Reward them when they ring it and pee or poop outside afterward. Tell your dog to “Go potty” when you take them outside. Reward with several treats, one at a time, when they go. Keep your treats in a convenient place so you remember to grab them on the way out. 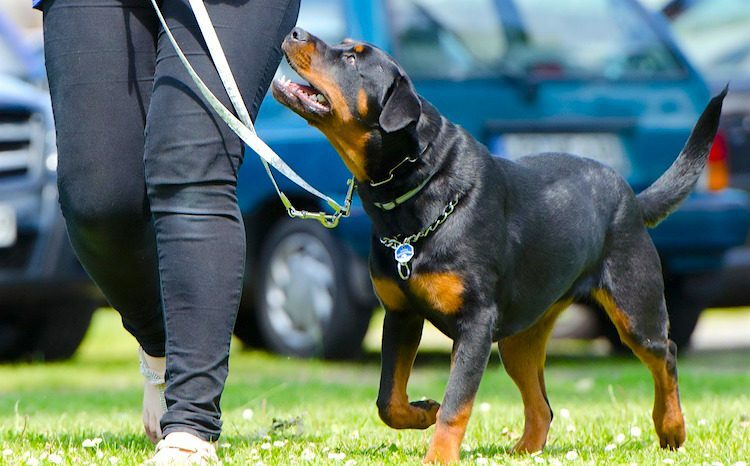 When leading your dog outside, take them on a leash to keep them from getting distracted. Slowly walk them around and encourage them to sniff, keeping them on task. 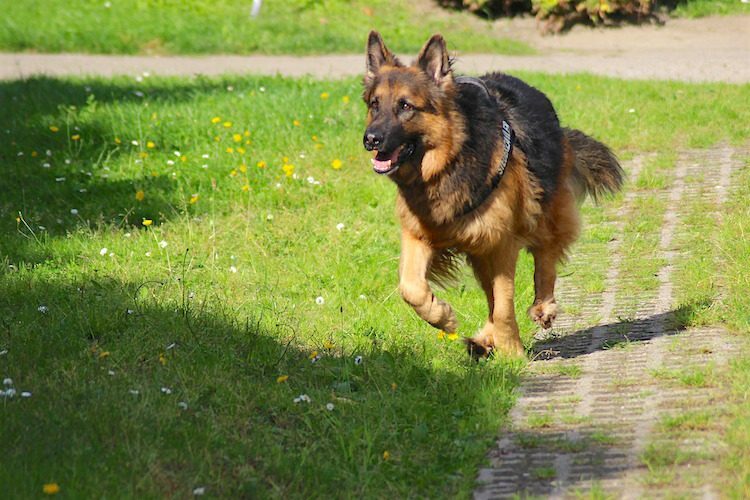 When the dog is fully trained, you can transition to letting them go outside without a leash if your yard is securely fenced. Use a potty-encouraging spray to encourage your dog to pee while outside. Simply spray it on the area you would like your dog to go potty, then take the dog over to that area on a leash and let them sniff around. You can also leave a small portion of the dog’s feces in that area instead, but don’t use too much — a messy area can lead to a dog to avoid the spot. Be patient. Remember: Peeing outside is new to your pooch. They don’t understand what you want them to do at first, and they depend on you to teach them. If they have an accident inside and you don’t catch them in the act, then simply clean up the accident and supervise the dog better in the future. A scolding after the accident won’t help them learn. We’ve discussed retraining a dog to go potty outside — but what if you need to retrain your dog to go potty inside the home? Many elderly dogs eventually need to learn how to go potty inside. Sometimes, a dog will get to the point where they can no longer navigate your deck stairs or walk far enough to make it to the backyard. Your older dog may also lose the ability to hold in poop and pee. When this happens, many people respond by creating an area inside where the dog can rest, be with the family they love and go potty without having to go far. Whether your dog has aged, you wish to retrain your small dog to go potty inside or you need your dog to learn it for a special circumstance or trip, there are a few modifications you may have to make. Using an indoor potty area that resembles something outside will be easier for your dog than something made of fabric. You can buy disposable real grass pads. Or you can fill litter boxes with cat litter, wood shavings or other outdoor materials. For larger dogs, you can make a toilet area out of a large, shallow plastic bin, a piece of grass sod, or some cat litter or wood chips. Pee pads are made of fabric, so a lot of dogs confuse them with rugs and carpet. If your dog refuses to go potty on a pee pad, then they’re likely trying to keep your home clean. Be patient. If they continue to struggle, consider switching to a different indoor toilet, such as a real grass pad, a litter box or fake grass. Add scent to your dog’s indoor toilet. You can buy a potty-encouraging spray and spray that on the area that you want the dog to pee on, or you can place a small portion of the dog’s feces on the pad. If you want to transition your dog to going potty on a surface that they initially refused to go potty on, then transition them gradually. 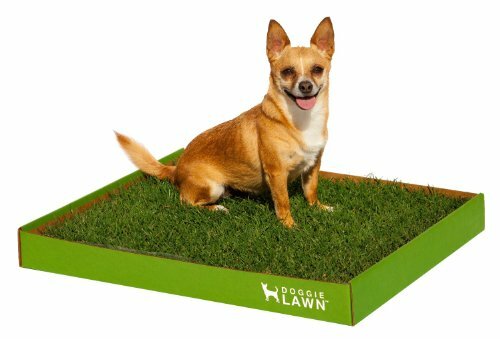 For example, if you want to teach them to use pee pads, use a patch of real grass on top of a pee pad in the spot where you want the dog to do their business. When they get used to peeing on the grass inside, then, over time, make the patch of grass smaller until only the pee pad is left. You can also cover the pee pad with dirt or grass clippings. If your dog is larger, and you want to teach them to use the bathroom on a smaller area, such as a real grass pad, start by placing several grass pads next to one another. Once the dog gets used to going potty in that area, make the area smaller over time by removing the additional grass pads, one at a time. Whenever you see your dog going potty in the correct spot, praise your pet and give them a treat. Is it ever too late to start training a dog? The answer is no. Whether you are socializing your older dog, teaching them obedience, modifying their behavior or house-training them, remember to be patient and enjoy the process. Done right, training benefits not only your dog but also you and your household. Improve your relationship with each other. Make your dog more enjoyable to live with. Let you involve them in more areas of your life. Improve communication and trust between both of you. Remember the hiking and traveling that I dreamed of doing with my dog, Mack, before I adopted him? Well, training paved the way. At 11 years old, Mack not only goes off-leash hiking with me, but also this well-trained senior dog makes friends everywhere we go, has traveled all over the United States, is adored by our toddler and has been a part of many adventures. Of course, most days we simply enjoy hanging out together on the couch — just as it should be.